New Zealand is a hotspot for biological diversity. Most native species are only found on these shaky islands. Because of this we are a long way from knowing just how many species we share space with here in the south west Pacific. We are even further from knowing the names of all of these species. One group that is very diverse in New Zealand is the spiders. About 93% of spiders are endemic to (only found in) New Zealand. When it comes to naming spider species some of the most obvious traits to use are genitalia, especially the males who often have elaborate structures. 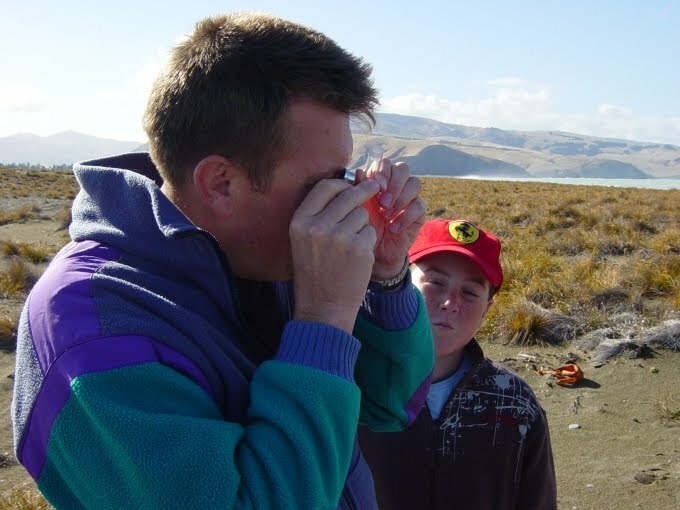 Why the focus on what our leading NZ spider researcher Dr Cor Vink calls 'the naughty bits'? Spiders are often morphologically conservative within and between closely related species - they look too similar to easily and consistently tell apart. Intricate genitalia allow species to avoid making costly mistakes in breeding as only members of the same species will, well, fit together efficiently. This is extremely helpful for spider taxonomists as it allows species to be identified. Unhelpfully, males are often required to be sure of the identification as female genitalia are usually not as elaborate or variable as the males. Males are also difficult to find as they often make up only a small proportion of a population and so many NZ species are only tentatively described from females only. One example is from the genus Clubiona which has a worldwide distribution and about 14 NZ species. One species, Clubiona blesti Forster 1979, is found throughout the South Island but was only known from females. Spider researchers Jagoba Malumbres-Olarte and Cor Vink from Lincoln University Entomology Research Museum have just published in Zootaxa and describe how they finally found males for this species and that their genitalia agreed with this being a distinct species. The researchers also used molecular data to confirm that the males found belonged to the females of C. blesti and that the evolutionary separation was sufficient for C. blesti to be a distinct species. They also confirmed the species status of several other Clubiona species in New Zealand. Who would have thought that genitalia would be so interesting? Names are extremely important in our lives. Giving something a name allows us to collect knowledge about that something. The something becomes part of our world. Something to interact with now and later. In biology names are just as important. We wouldn't get far if we had to talk about the smallest, flappy thing that swims around in the big, blue wobbly thing. Or adorable, fluffy thing often found in urban structures with big-brained bipeds. Calling then Little Penguins or kittens respectively saves a lot of time and is so much more precise. In biology we are most interested in species names, and because humans are so good at giving names to living things, science has agreed on a system that gives each species a scientific name, the genus and species names. 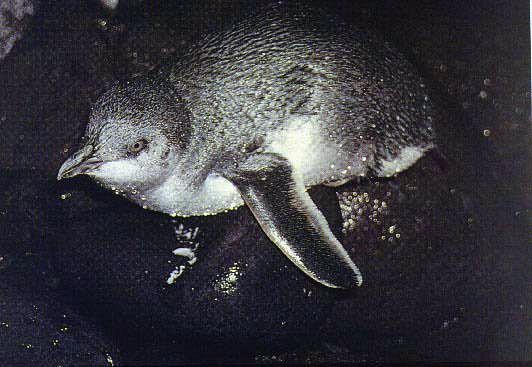 Little penguins are also known as blue penguins and fairy penguins but to science the species is known as Eudyptula minor. And it is known by this name everywhere regardless of what the locals call it. This means that scientists know exactly what species is being talked about when we read about a piece of biological work. The science of naming species is known as taxonomy. This is an old science as far as biology goes, going back to Linnaeus in the 18th Century. Given that scientific names underpin all biological research you would expect that taxonomists would get due recognition for the job that they do. This is not exactly the case. In a paper in Bioscience, Taxonomy and irreproducible biological science, Lincoln University's Cor Vink and Rob Cruickshank join with Canadian Pierre Paquin to point out that taxonomy is given a poor deal in scientific papers. Basically they argue that the methods in a scientific paper should be detailed enough for someone to re-do the experiment based on what they see in that paper. For the most part this is the case. But, curiously, when it comes to the fundamental question of which species the research is actually about there is usually nothing to say why the scientists were confident about the identity of the species that they were working on. This oversight probably stems from taxonomy being an old science and current scientists feeling that they just don't need to worry. In this day of molecular studies with new species being discovered at a fast rate, old species being split into several new ones or several old species being merged into one, there is an important need to know that the species you are talking about is the one Joe Bloggs discovered in 19 ticketty boo rather than the subgroup identified just last year by Jane Blogger. Vink and his colleagues argue that acknowledging the taxonomic source of the species that you are working with is good science, good for your paper, good for the taxonomist (as they get some kudos for their work) and doesn't add much to the length of papers. Which is nice when you want to tell you little penguin (Eudyptula minor Forster, 1781) from your kitten (Felis catus Linnaeus, 1758). Anolis lizards invade New Zealand! ....And are promptly poached, apparently. Last year TVNZ's website had hyraxes invading Ulva Island. 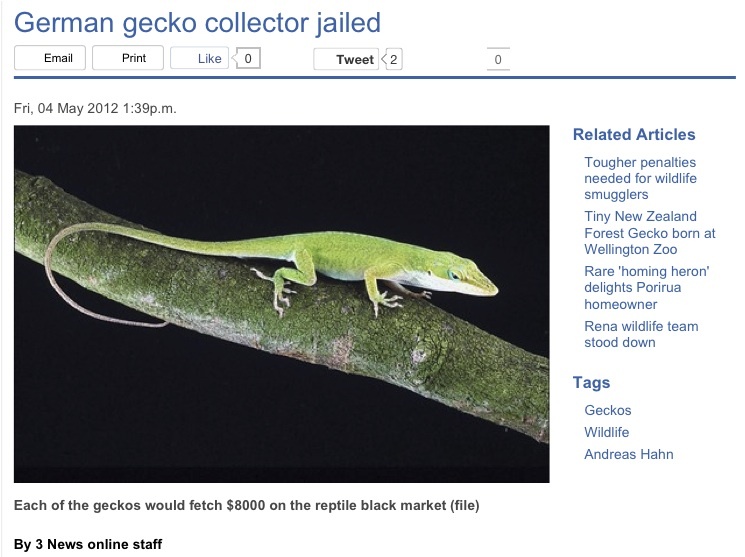 TVNZ got the image for yesterday's story about gecko poaching right, but TV3's online editors weren't quite so careful in their use of stock photos. If only the poachers were so clueless. Also a bit disturbing: when you search TV3's site for "gecko," the poaching story pops up underneath a Google ad link titled "Geckos for sale...."
Times in my life when I have thought worriedly about my impending mortality have, fortunately been few and far between. Three of these events have been associated with the recent Canterbury earthquakes. The most frightening was the 7.1 event of September 4, 2010 which kicked it all off. Getting thrown out of bed at 4.35am while your house heaves and groans and shudders around you for 45 seconds gives you plenty of time to worry. February 22nd, 2011 and I was in central Christchurch when the 6.34 hit at 12.51pm and devastated the central and eastern parts of the city, the intense shaking for 20 odd seconds allowed little more than a hectic stumble towards the walls of the meeting room I was in. Finally, the 6.4 on June 13th at 2.20pm, although not nearly as shaky, was all the more scary for being at work on the 5th floor of our science building. Your work isn't supposed to make cracking and smashing noises! Prior to these events, however, the most intense and scary time I had was in the field helping a PhD student. 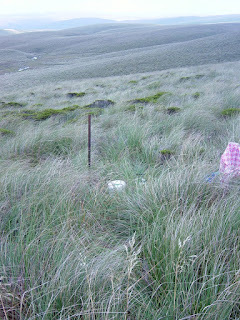 In February 2008, I found myself in Te Papanui Conservation Park on the Lammermoor Range near Dunedin. The park is a beautiful tussock-filled wilderness of rolling hills. I was there to help my PhD student Jagoba Malumbres-Olarte, a Basque from northern Spain. Jagoba was interested in spiders and we had had directed his energies into understanding the diversity of spiders in tussock grasslands at mid-altitudes. Jagoba's fieldwork involved resampling sites several time through the park. 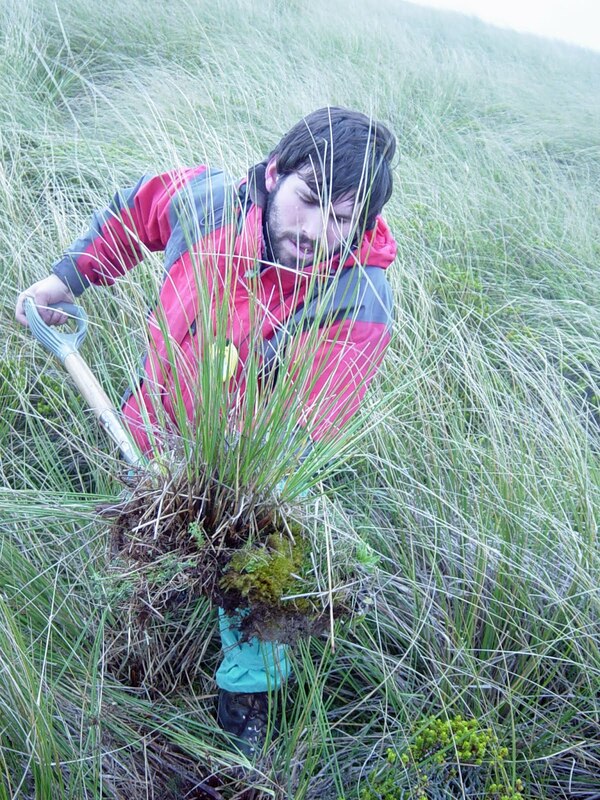 In reality, as a found out when I went to help, this meant driving along a small, rutted track for long periods, wading through the tussock sea with tape measure in hand, digging up tussocks to put in sacks for later examination and clearing pitfall traps. All in a pretty, if forbidding, landscape. The weather was not so good and then there was the wind... The Lammermoors are a great place for wind. There are few trees to impede its progress and the rolling landscape allows the wind to reach its full potential. We got back to our campsite in the darkness (GPS is a wonderful thing in a landscape with few landmarks. Luckily we had set a tent up earlier in the day. We parked the 4WD on the windward side of the tent to give some protection as a gale was starting. And how! There was a high wind blowing and the stars were shining bright. As the night progressed the wind continued to pick up until it was deafening. I had never been in anything like it. It eventually blew itself out before dawn and we were met by a brilliant sunrise. Sleep-deprived, Jagoba and I set off for another day of sampling. So was it all worth it? What did Jagoba find? He successfully obtained his PhD last year and now his first paper is being published. Jagoba has had a paper published in Insect Conservation and Diversity. In this research Jagoba was interested in spider diversity in alpine tussocklands. Spiders are often top predators in many ecosystems, especially in New Zealand but not a great deal was known about this important NZ habitat. Jagoba obtained some study sites in Te Papanui Conservation Park to the east of Dunedin in the Lammermoor range. Jagoba collected spiders in two ways. First, he used pitfall traps (digging small containers flush into the ground where unsuspecting individuals fall in. Second, he removed a whole tussock plant from each sample site to take back to the lab where all of the inhabitants were collected. In addition to simply recording the diversity of the spiders found, Jagoba was interested in finding out about what lead to the variation that he observed. So, many different data were collected from each site. The upside of a sampling approach like this is that you can get thousands of samples. The downside is that you can get thousands of samples! Jagoba spent the best part of a year and a half identifying the many different spiders (14465 individuals from 53 species!) that he had found in his samples. One of the ideas that Jagoba was keen to test was about whether the diversity of plant species impacted on the diversity of spider species. 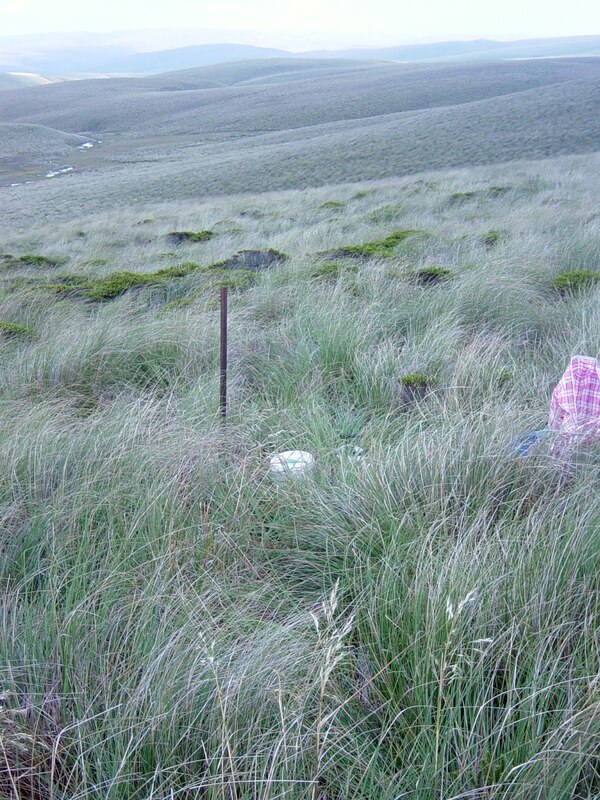 Although tussock grasslands are dominated by one species, there are other plant species scattered throughout. There was a basic link between diversity of plant and spider species, the more complex the habitat the greater the number of spiders. The structural complexity of each site was also important, the more branches and 3D-ness of the site affected the types of spider species that would live in an area. Environmental factors, like soil moisture also played a role in affecting which species were present for both plants and spiders. One of the best outcomes was discovering that one kind of spiders - wolf spiders from the family Lycosidae, could be used as an indicator species to signal which other spider species would be present in an area. Indicator species are important in that it saves someone like Jagoba having to work through thousands of samples when they can only look a few hundred. So was it worth a night of discomfit to find these results? Of course. And there is more to come from this work.